If you are a dedicated teacher wanting to improve your skills and increase student learning, consider Missouri Western State University’s Masters of Applied Science (M.A.S.) in Assessment degree as your next career move. Today, educational institutions from preschool to college are faced with the demands and challenges of high standards and accountability. Graduates of the M.A.S. in Assessment degree will learn how to meet these expectations while improving quality within their organizations. 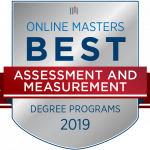 And with Missouri Western’s focus on applied learning, our programs have been ranked Best in Real-World Training by Online Masters. Successful completion of this master’s degree, in conjunction with all specified prerequisites, will prepare graduates to successfully complete the Missouri Content Assessment (MoCA) and qualify for the K-12 Mild/Moderate, Cross-Categorical special education licensure from the Missouri Department of Elementary and Secondary Education. You are not required to hold a current teaching license in order to be admitted to the Cross-Cat-Sped master’s program. However, completion of this graduate program will not provide you with the qualifications necessary to receive an initial teaching license. IF you hold a license in any area of education (early childhood, elementary OR secondary education) when you begin this graduate program, successful completion will qualify you for State of Missouri certification in K-12 cross-categorical special education. How will the K-12 Cross-Categorical Special Education option prepare me for a career? What are the unique benefits of the K-12 Cross-Categorical Special Education option? Are you ready to declare a program of study? Download, sign and submit the form(s) to the program director. Bachelor’s degree in Education or a closely related field from an accredited College or University. Provide transcripts of all previously completed university level work – both Undergraduate and Graduate. The Federal Teacher Assistance for College and Higher Education (TEACH) Grant is intended to assist students in becoming highly-qualified teachers and is available to those who are completing coursework in a TEACH Grant-eligible program – a high-need field. Both TESOL and SPED qualify as areas of critical need.